Neon lights started to flicker on along the street as the sun began to set; exhaust from the fumes rises up in a billow of smoke as hordes of scooters make their way down the bustling street. “Just walk straight, DON’T make eye contact with the cyclists” a voice I remember from the first time Vietnam three years ago-my professor from Semester at Sea warning me about the busy streets of Saigon. I take his advice as I walk down the same streets three years ago, it is strange to be back but a familiarity and nostalgia kicks in. My instinct takes over, and my memory guides me back to one of my favorite spots in the city – the Ben Thanh Market. I met up with Jodi from Legalnomad.com, a dear friend of mine that I met in Portugal a year and half ago. She moved to Vietnam, and does amazing food tours. I took her up on her offer to show me the best food that the city has to offer. 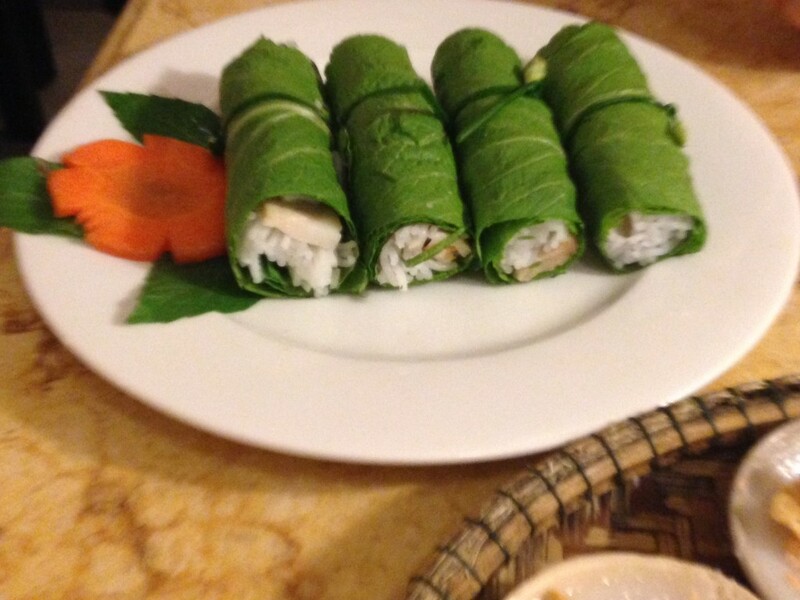 Cuon Diep-Pork, Rice noodles and shrimp tightly wrapped in mustard leaves. “Oh, the last time I was here, I ate at a place called Pho 2000, have you heard of it?” Jodi replied back to me with a furrowed brow and said “that place? Oh it is terrible now!” I shrugged, here I am talking to a foodie who does fantastic food tours and the one place I happened to mentioned was on the decline-the foodie in me was embarrassed. Not soon after I had mentioned that, we walked past the building where Pho 2000 was, and it is now “The Coffee Bean& Tea Leaf”, Pho 2000 had moved upstairs to a little room right next to the bathrooms, tucked away upstairs-forgotten. Jodi is celiac, and I had just cut out gluten from my diet, since I recently found out that I have sensitivity to gluten. The amazing thing about her food tours is that all the food is gluten free, which is fantastic for those that are celiac and gluten sensitive visiting Saigon. We walked to a small open air restaurant in the alley, if you knew where to look- you would be able to find it. With red little chairs, and a long table and several small tables seated for 2-3 people scattered around the place. They immediately knew who she was, and she immediately knew what to order, she was so excited for me to try the food in one of her favorite places in Saigon. The waiter brought out a tray of Cuon Diep, a pork, shrimp, rice noodle that was wrapped around in a bright green mustard leaves. Wrapping up the pork, shrimp and the rice in mustard leaves gave it a little kick, and yet felt refreshing to taste- a mix of tartness and sweetness. 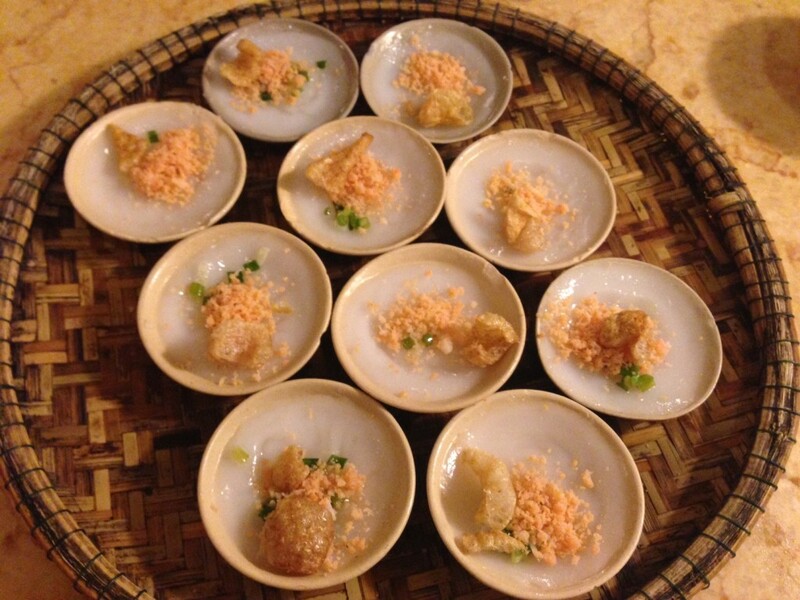 The second tray was Banh Beo, a tray with about ten small dishes of steamed rice pancakes. It is more gelatinous in texture; basically you scoop it out of the little bowls it comes in. On the way back to the market, her eyes lit up “Oh! I wonder if the coconut lady is at the market, let’s go see if she is there, she is the sweetest lady you will ever meet, and she runs a coconut stand but she only has three fingers on her hands, she is badass, you would love her!” We make our way down the street, avoiding the motorcycles at every turn and Jodi spots the Coconut lady and runs up to her and hug her, and then she introduces me to her. To which the coconut lady gives me a big grin and a hug, “Hello!! !” she pulls up a chair and tells me to sit, she would bring out the freshest coconut juice that she has. She brought back a coconut that looks like a shape of a hut and put a straw in it and smiled at me- watching me as I take my first sip of the coconut. It was divine- “Oh my god, this is amazing” I told her, to which Jodi translated for me. It was ice cold, the juice was so crisp, so pure that I couldn’t believe that this was coconut juice; it was deliciously sweet yet it had lightness to it. 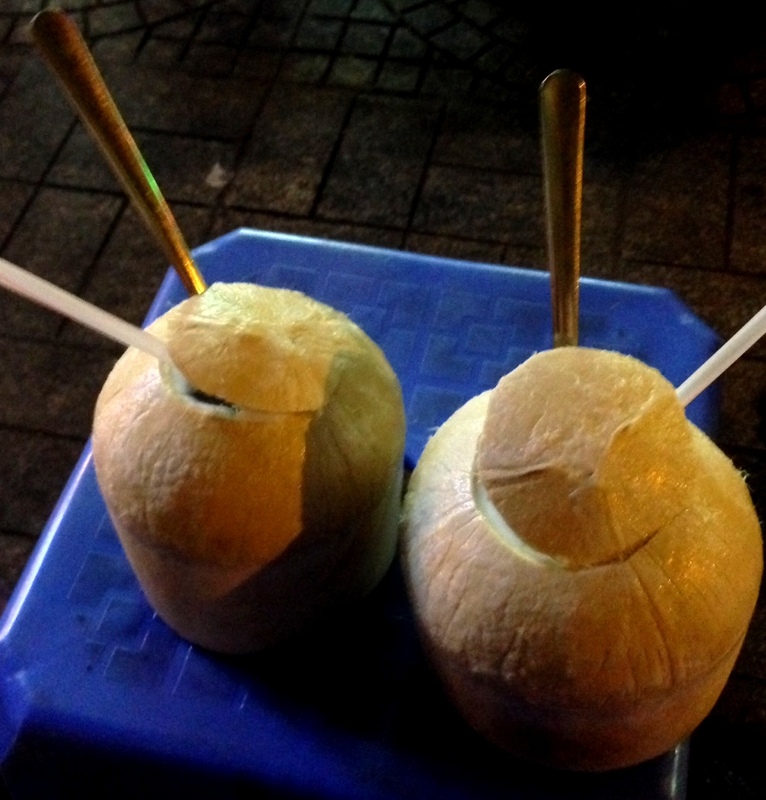 It was quite possibly the best coconut juice I have ever had, and it was on the side of the street right next to the Ben Thanh Market. Make sure you look for the coconut lady when you visit the market, it truly is a perfect remedy to battle the sweltering heat in Vietnam and her kindness will lift your spirits immediately. I am a photographer who would like to become a travel writer. However, I’m not sure where to begin, I have travelled to many parts of the world when I was in the British Merchant Navy. Along with many holidays, I have read your blogs, and your traveling stories; you are an amazing lady. I am pretty broad minded, and I love chatting with people from all walks-of-life. Could you please give me some direction and advise where to start? I worked in HCMC from ’09 to ’11 and it is one of my favourite cities in the world. Your description made me nostalgic for the people and experiences. The Vietnamese are a truly great people and are justifiably very proud of their culture and history, particularly the way they eventually sent all interlopers packing (Chinese, French, Americans), and have moved on from each, their dignity intact. Negotiating the HCMC traffic, while not for the faint of heart, is one of my very enjoyable memories. You’re mentor was so right, don’t look any vehicle in the eye. Eye contact is the start of an interaction that you really don’t have time for! Your imaginative use of the available tools to find your way in the world without hearing is truly inspirational for all of us lazy, fully-abled types. Looking forward to your further adventures. I did not like Pho 2000 as well! My favorite was a place fairly close to Benh Thanh! I am glad to have found your blog because now I am addicted. Vietnam is surely the country that food-lovers like. full of all kinds of yummy foods, small portion, cheap but the good taste. as to the traffic, it’s terrible to me, paradise of motorbikes, when i was walking on streets, it seems that they ran to you in all directions. it took me much time to cross the roads. but when i complained to another tourists, they told me that the solution was you go straight, no need to wait the scooters. actually it works. My friend and I were in Saigon and we let one of the bike guys get us. He totally ripped us off but we had so much fun that day with him that we didn’t even care. My friend and I were in Saigon and we let one of the bike guys get us. He totally ripped us off but we had so much fun that day with him that we didn’t even care. Sometimes it’s worth it.